MY SHOES ARE TAKEN TO A PROFESSIONAL COBBLER FROM GREECE, WHO HAS BEEN DOING THIS FOR 50 YEARS. ALL THESE SHOES NEEDED WERE TO BE CLEANED AND CONDITIONED. THE ADHESIVE WAS CHECKED AND IS STRONG. THE SOLES AND HEELS ARE IN EXCELLENT CONDITION SO THEY NEEDED NO WORK. OBVIOUSLY WELL STORED AND PRESERVED FOR YOU TO WEAR AND ADD TO YOUR COLLECTION. THEY ARE IN AMAZING CONDITION FOR THEIR AGE. Jackie Kennedy made this brand famous in the early sixties. 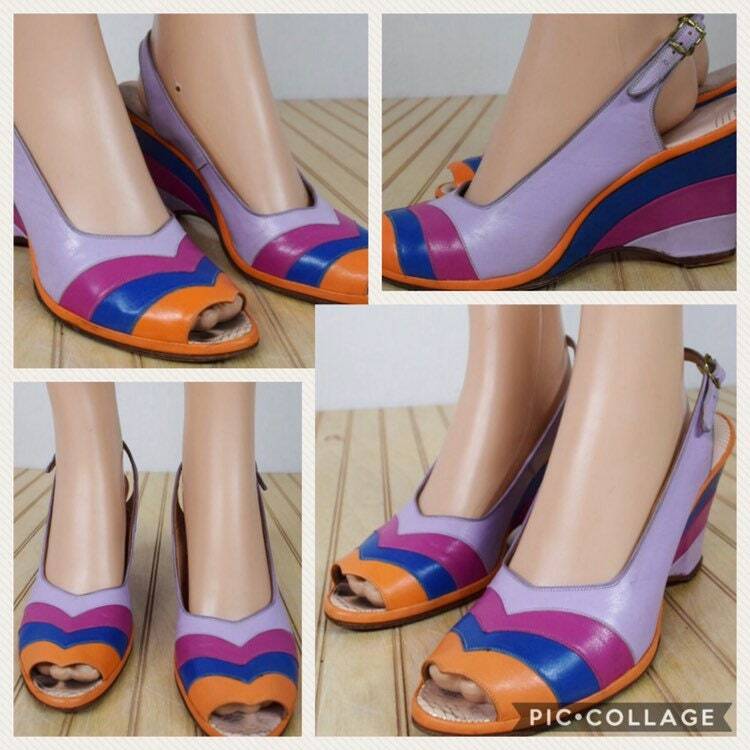 Leather shoes made with different colored stripes. The front has a chevron pattern in light purple, magenta, royal blue and bright orange. Come to a cool point by the peep toe. 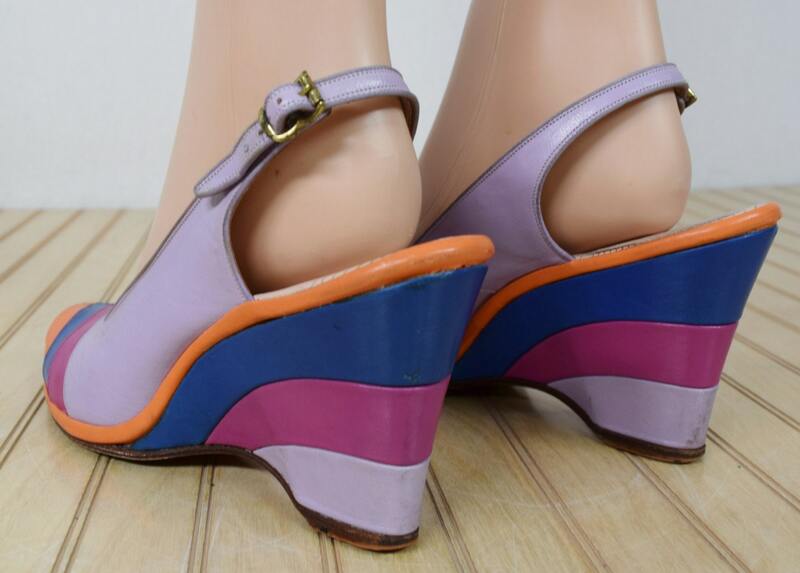 Have a striped wedged heel. Leather soles and leather heels on the bottom of the shoe. They are very light weight and extremely well made. Condition: Shoes were were cleaned and conditioned, they needed no restoration. All the adhesive was checked and is strong. The inner soles are great, and the leather soles and leather heels are also in great condition or would have been cobbled. They do have some little marks here and there consistent with age but otherwise very clean.